They are driving economic change in cities, but what are ‘knowledge-focused industries’? A Century of Cities, a reflection on urban economic change since 1911, was recently published by Centre for Cities. An informative read, which does something many economic development reports do not do, it looks at the history of a place to see how it arrived where it is today. I am a great fan of this approach, and carried out similar research in the past, it’s vital to our understanding of cities, their landscape, assets, structure and culture. The report did however, make me reflect on the term ‘knowledge industries’, and the time period chosen. What is a knowledge industry? The report defines this in a traditional way, related to knowledge intensive business services. From a historical perspective, all growth and change has happened through innovation, change and the application of the technology available at the time, whatever that may be. Structurally these changes often lead to jobless growth, where the technology replaces the human labour cost. In pre-industrial society, big changes related to agricultural technology such as crop rotation or the plough. New technology which revolutionised jobs and industries. During the industrial revolution, cotton was the knowledge industry, driving innovation in the northern towns, with ready labour pools, the right climate and access to energy from fast running water. The growth of empire fuelled demand for the technology and knowledge Britain had. Machinery and weavers with the knowledge to use it, became the knowledge workers. On the back of industrialisation, and the need for new, quicker production methods, many northern universities were established, grew and flourished. It is easy to view previous periods through modern eyes and view old established industries, as exactly that, old, low skilled and low knowledge because of our own new perspectives on what constitutes ‘knowledge’. Ask any 20 year old about a typewriter and you can witness this same derision about ‘technology’ and ‘knowledge’ worker. Work by Jeremy Howells on economic geography highlights that knowledge “involves applying reason to experience” and knowledge exists within individuals, and that body of individuals is what drives industry growth. 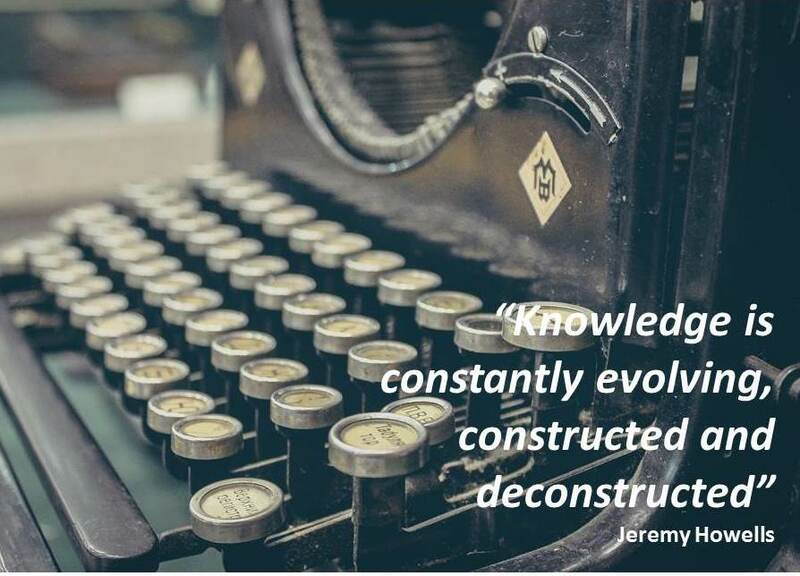 He goes on to say “knowledge is constantly evolving, constructed and deconstructed”, this process is highly localised, both in time and geography. Cities therefore facilitate this knowledge growth, the density of population, endless possibility of interaction, and transfer of people across businesses, personal contacts and networks drive this knowledge interchange. This tacit knowledge drives innovation, resilience to change, ability to respond to risk and shocks. Knowledge exchange has always been a key driver for businesses locating in proximity to one another, sharing workers and knowing your customers. The question is, is any industry completely devoid of knowledge, and why have places failed to utilise knowledge to their advantage across all industries? It is easy to group all manufacturing into low skilled, low knowledge base, but the reality is much more complex, how do BAE or Astra Zenica fit into this classification? The term knowledge worker implies that all other workers are ‘non-knowledge workers’ when in reality every industry has a rich, diverse business and people base which organically prepares them for shocks and change. You can only change the path of places by ensuring they retain their knowledge base, both professionally and personally, investing in their attractiveness and the quality of opportunity for the knowledge workers, whatever the industry. The Idox Information Service can give you access to a wealth of further information on cities and economic development, to find out more on how to become a member, please contact us. This entry was posted in Business and economy, Uncategorized and tagged centre for cities, cities, jobs, knowledge. Bookmark the permalink.